The Citroen C3 hatchback is a fun, small supermini that’s ideal for new drivers, young families or someone just looking for a great day-to-day runabout. Available to lease anywhere between 1 to 6 months on our rolling short-term car leasing offer. Prices start at £229.99+VAT per 28 days. Following an eye-catching design shared with other modern Citroens, the C3 has funky stylistic features and separates it from other vehicles in the same class. It comes available with some interesting colour choices and the top of the range ‘Flair’ models have Citroen’s new ‘Air-bump’ technology. The rectangular cabin design is equally as interesting to look at and is laid in an intuitive manner. All of the important controls are easy to navigate around and within reach of the driver. Reducing the chance to be distracted from the road ahead. Due to the size of the car, it’s incredibly easy to manoeuvre and makes it the perfect choice for drivers who may frequently drive in and around the city. As tight spots are easily accomplished with the Citroen C3. This car is a fierce rival against similarly-sized vehicles such as the Fiat 500, Toyota Aygo or the Peugeot 108. Don’t hesitate to speak to a member of our team to find out more. 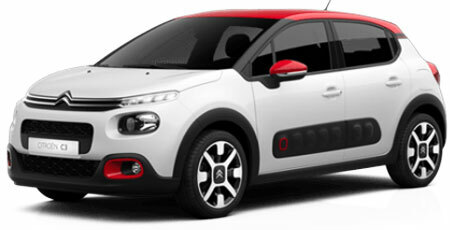 A standard 1.2-litre petrol engine is equipped with the Citroen which produces 82 horsepower. Resulting in great economy figures, although the performance figures may not be as impressive compared with larger hatchbacks. On a combined driving cycle (highway/city) you can expect the car to return around 60 MPG. It also sits in a cheap tax bracket, thanks to a low emission figure of just 109g/KM. This car is extremely affordable to run and cheap to insure (depending on area) making it a great daily driver, for those looking for a car on a budget. Practicality-wise, the Citroen C3 is equipped with 5 seats and has enough space to squeeze in up to four adults, or three children abreast in the rear seats. At the back, the car has a 300-litre boot and is ideal for the weekly shop or a piece of large luggage.